Part Used : Leaves, Flower, Oil, Seed. Habitat : It is evergreen and grows throughout india. Uses : It acts as vermifuge, insecticide, astringent, tonic and antiseptic. It possess anti diabetic, anti bacterial and anti viral properties and used successfully in cases of stomach, worms and ulcers. Root barks possess astringent, tonic and antiperiodic properties. It is also useful in malarial fever. The oil is used in making neem-based soaps, shampoos and toothpaste. Leaves are used to cure chicken pox. 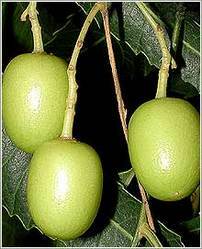 It is also used in the treatment of acne and has blood purifying property.